Back in 2013 my girlfriend and I took a motorcycle tour of Spain. Unfortunately we didn’t get much time to spend in Bilbao, but we liked what we’d seen so far. Fast forward to 2015 and another motorcycle tour, this time of Morocco, and I found myself riding through Spain again. On the way back I booked a ferry to the UK from Bilbao and had a number of days to kill before departure. What better way to spend the time than to explore the city I missed out on in 2013. I stayed at Casual Gurea (via booking.com) which is in the old town. Since I was on a motorcycle it was a bit of pain to get to as the old town is a traffic free zone. After a couple of laps of the area I found a parking spot by the river. I did enquire about parking at the hostel (let’s not kid ourselves. It bills itself as a hotel but it’s a hostel) but they wanted €18 per night. Seriously €18 to park a motorcycle? The place was basic, but adequate for my needs. The wifi was good in all parts of the building, and the staff were friendly with good English language skills. One thing I found when looking for accommodation is that hotel prices in Bilbao tended to be more expensive than many other parts of Spain, and of lower quality. I thought Granada was bad with its shared bathrooms and dingy private rooms, until I had a pleasant stay at Terraza Monasterio, well Bilbao is similar unless you really splash the cash. I guess its due to the limited land available. 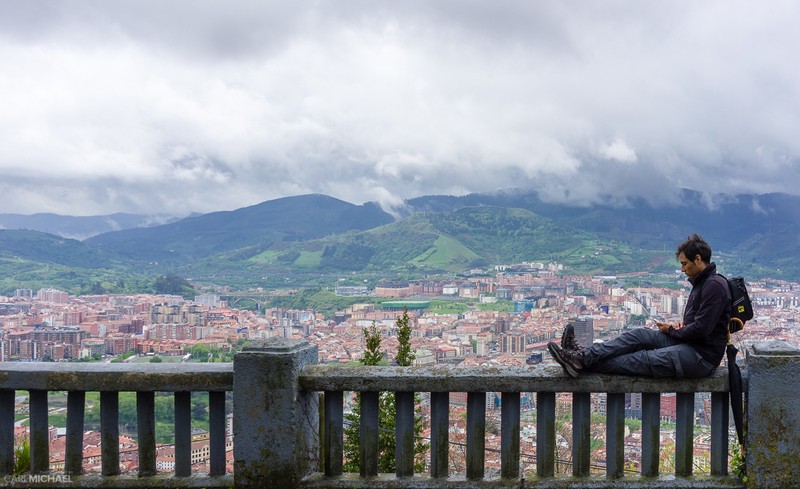 It was late November when I first visited Bilbao, and although the journey there was freezing cold, once in Bilbao the weather was surprisingly mild. The city is surrounded by three mountains, and so the weather is subject to frequent change, but I’m used to that coming from the UK. Clouds form around the mountains and deposit their contents on the city. This has the benefit of making the surroundings lush and green, but the downside is that it rained heavily everyday during my recent stay. 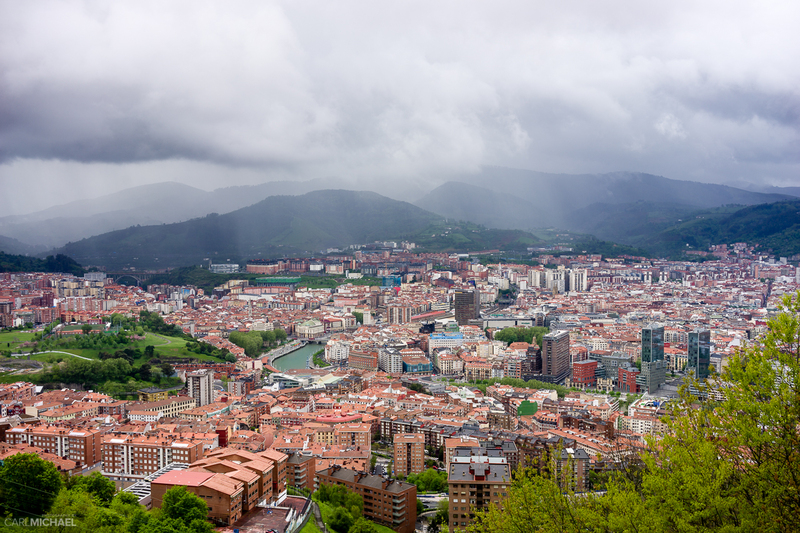 Everyone knows Bilbao for the Guggenheim museum building, and while Bilbao as a tourist destination owes a lot to this iconic building, there’s much more to do. As a keen (amateur) photographer the Guggenheim played a large part in my stay, but the highlight of the trip for me was the €1 ride in the funicular to the top of Artxanda Mountain for fantastic views of the city. I actually walked down to the road to get most of my shots in order to avoid having large power lines the images. My other activities included a walk around the old town and visiting pintxos bars for which Bilbao is also renowned. 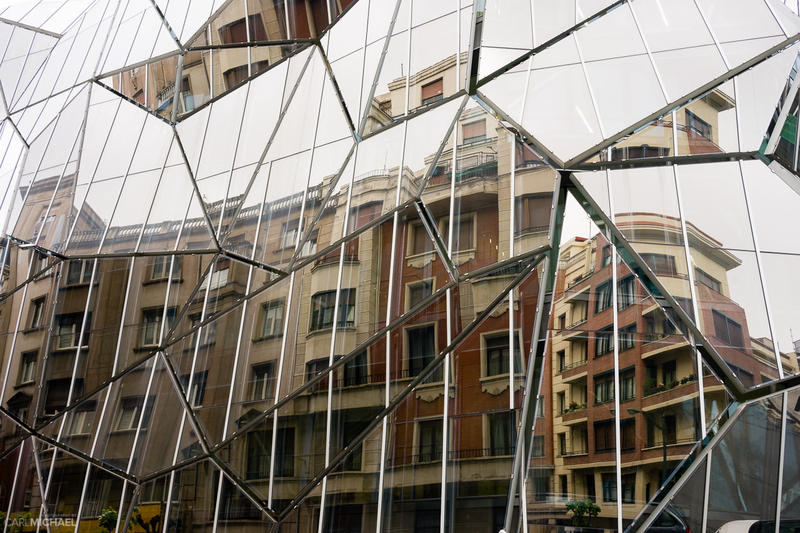 I’d previously seen a photograph of a modern glass building with reflective panels placed at odd angles. I was keen to get my own shot of this unique building, but as it’s not very well known finding it was difficult. I was told by a local that is was the Ministry for health, hence it no being well known online. Of course once I got there the heavens opened, but I was able to get my shot off and capture the image below. I’ve been to many places in Spain and oddly not really found the food to be great. Bilbao was pleasant surprise in this regard. Touring the pintxos bars is a great way to see the city, enjoy a beer and cure your hunger all in one go, but i also found the restaurants to be reasonably priced. If you want huge portions and a quality European beer check out Crazy Horse Bar just across the river from the Guggenheim. I was crazy enough to try to eat one of their hamburgers for two. Half of it ended up being my lunch the next day.